Once again, Roof.Net finds itself on the receiving end of some very notable awards for Virginia based companies. The first is an award that is directly related to the roofing industry they are in. 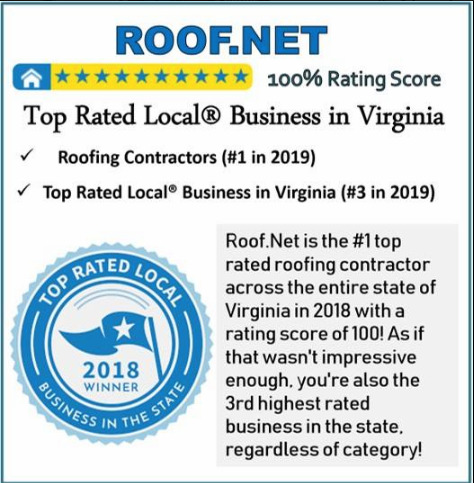 They were rated the number one Top Rated Local Business roofing contractor in the entire state of Virginia for 2019. This award was based on Roof.Net’s composite review scores for the year. The second award may even be a more notable accomplishment for them because the competition for it was a much larger sample size. Those same high composite review scores enabled Roof. Net to be named the number three Top Rated Local Business in Virginia regardless of the type of business a company is in. More on these two awards can be seen here at https://bit.ly/2WDMMvj. Someone can also find out more information about the criteria for being selected for Top-Rated Local Awards at https://www.topratedlocal.com/awards. This Fairfax, Virginia based company has been recognized very often over the last several years for the work they do. Ken Briesemeister, company president, mentioned some of the other awards they have received over the years. These include being named three years running to the nationally recognized ‘Best of the Best’ award. Roof.Net was also voted to Sears Best Roofing Trouble Shooters list from 1993-2000 and seven times Roof.Net has received the Talk Award for contractor excellence. All of the review scores on their website add up to a highly respectable 5 out of 5-star rating. It’s also interesting to note that out of over 500 reviews that have been posted to Roof.Net’s website, no rating is less than 4 out of 5 stars and there are only two 4 out of 5-star ratings. The company openly displays every review written on them. Someone just has to click on ‘reviews’ from the drop-down menu section at the top of their website in order to see these reviews. There are also many things that can be found on the company’s website, http://roof.net/, besides just the reviews that people have written on them. The website will also give a person much more detail about the roofing and other types of work the company does. These include a variety of specialized roofing services such as roof repairs and roof replacements. The company offers fast response emergency roofing services after major storms too. Roof.Net’s service techs will even clean someone’s roof if they are requested to do so. One of their most specialized roofing services is the infrared moisture detection that helps them pinpoint roof looks. It makes them one of the few roofing companies that can precisely locate hard to find leaks in a short period of time. Roof.Net also offers no-cost, no-obligation onsite inspections and will provide the customer with a free roofing services quote after that inspection has been completed. Roof.net services a very wide area of Virginia. Most of these areas are about an hour’s drive west of Washington D.C. They include Fairfax, Fairfax County, Loudoun County, Prince William County and several other communities in Northern Virginia. Besides their website, one can also find out more about the company on their Facebook page at https://www.facebook.com/roofrepairva. Briesemeister has stated that they do return all of the messages that are left on their Facebook page very promptly. There is also a google map page on their Facebook site that shows where the company’s home office is located in Fairfax. Roof.net is an A+ rated roofing contractor specializing in roof repair and replacement located in Fairfax Virginia and servicing all of northern VA. Contact Ken Briesemeister for more information.